So, this afternoon I said to Nate, "Honey, guess what tomorrow is!" Without hesitation he said, "The end." "Noooooo... well, yes. It's the end of NaBloPoMo. But, it's also December 1st, so according to you we can officially put up Christmas decorations. Yay!" However, it does take dedicated time. With my laptop, I have definitely been able to post much more often. But, sometimes it's nice to let a day go by and not stress about it, you know? Because there are just days... Just. Days... that I can't quite get there. That other things should be more important. And, I love NaBloPoMo, but blogging should not take precedent over those "should" things. But I also realize that I CAN be more diligent with posting... I CAN post more often... if I get my rear in gear and stay a bit more organized time-wise. We all know that is not a strength for yours truly. Never has been. I'm wondering if it ever will be. But, I am always on the quest to reach my goal of Effective Time Manager. NaBloPoMo. You will be mine again next year. Because I'm that good. I'm. That. Good. Thanks to my readers (the whole handful of you) who stuck with my through this. You guys are awesome! 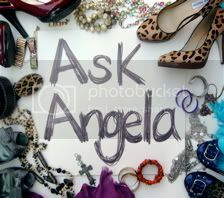 You should all fly here to Colorado and we'll have an I Actually Read Angela's Blog party. Maybe it will even be a Garage Sale White Elephant party. Par-tay! Sounds like a plan to me. I DID IT TOO! (And oddly picked the same I Did It button. Congratulations! I like the challenge, it's fun. "Turkey for the girls and turkey for the boys..."
Save the Ta Tas? Evidently, not so much. "It's beginning to look a lot like..."